Rubicon, are a small indie team who gained some fame with the indie iPhone game "Great Little War Game." 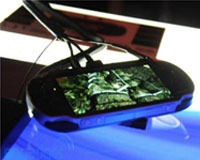 However now Rubicon have been reported to be working on a PS Vita port of Great Little War Game. But due to the low budget and "indie" factor of the team, Sony themselves have been loaning out PS Vita dev kits for a little charge of NOTHING! A technical director for rubicon, Steven Haggerty, was understandably impressed by Sony, saying that the manufacturer is “the best of all” with regards to indie developers.